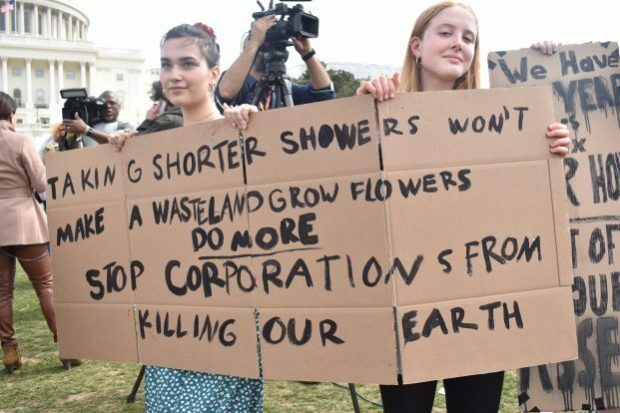 On Friday, March 15th, hundreds of high schoolers protested for climate change in front of the Capitol building in Washington, D.C., joining a global effort of young people from more than 100 countries. The goal of protests like the climate strike is to raise awareness and increase civic activism among youth. Organizers are also hoping to persuade young people to vote. Although 18 to 29-year-olds did vote in greater numbers in the 2018 midterm elections, it still remained on the low side at 31 percent. Overall voter turnout in the U.S. trails behind other developed countries, according to a study from Pew Research. Weissman says climate change will heavily impact her voting decision in 2020. “We are the next generation of voters, the next generation in Congress and the last generation with the chance to reverse the effects of climate change. We have no choice but to be the generation that creates change,” Weissman said. Kenneth Warren, a senior at T.C. Williams High School in Alexandria, Virginia, started a local environmental organization dedicated to promoting sustainability in his school district. Overall, 48 percent of adults believe that climate change is due to human activity, 31 percent believe it is due to natural causes and 20 percent believe there is no evidence of global warming. While many teens believe in calling Congresspeople and local leaders to voice their concern for climate change, others are skeptical of the government’s ability to take action to reduce the impact of global warming. “Our politicians and our leaders are not doing their jobs,” said Adria Ivkovic, a senior at Walter Johnson High School in Bethesda, Maryland, who attended the climate protest. Warren says striking and advocating for government action builds accountability as young people challenge politicians’ inaction with a vote out of office. “When we protest, we gain equality for all,” said Warren.